TWO YEARS AFTER A SERIES OF CYCLONES DEVASTATED MADAGASCAR, WHAT HAS BEEN ACHIEVED THANKS TO EDUCATION CANNOT WAIT’S EMERGENCY SUPPORT? When disaster strikes, children are the ones that lose out the most. In March of 2017, Cyclone Enawo hit the coast of Madagascar with gale-force winds that gusted up to 180 miles an hour. The destruction displaced some 240,000 people, and the damage to school infrastructure was unprecedented. Over 3,900 classrooms were damaged, with 2,300 totally destroyed. 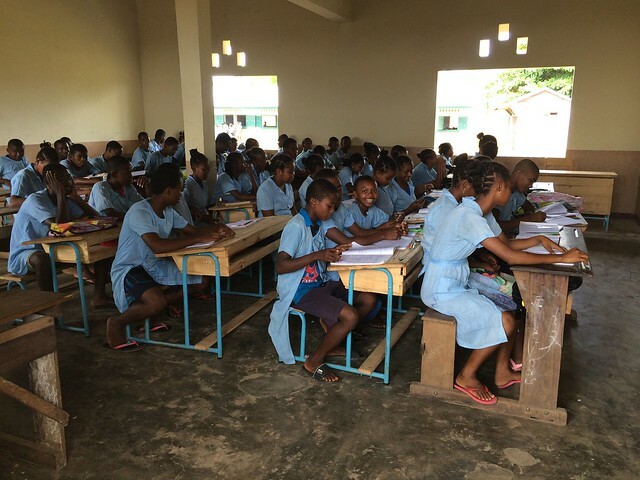 The devastation in Enawo’s wake left over 120,000 children without a safe space to learn. “Our two classrooms were destroyed to the ground and we could not go to class for two months. We were unhappy but there was nothing we could do,” said Faniriantsoa, a young girl who was ready to complete her last year of primary school before her life and her future were interrupted. As a result of climate change, the world is seeing an increase in severe weather like cyclones, droughts and floods. When these life-changing events hit, families struggle to access food and water. For girls like Faniriantsoa, risks of gender-based violence increase, and without access to the relative safety and stability of schools, young lives are put in limbo. To respond to the crisis, Education Cannot Wait – a global fund for education in emergencies and protracted crises that seeks to mobilize US$1.8 billion by 2021 to reach 8.9 million children – invested US$400,000 in a fast-acting 12-month programme in the Sava Region of Madagascar. The programme closely aligned with the Flash Appeal issued by the Government and humanitarian organisations after the cyclone, and was implemented on the ground by UNICEF, UNESCO and the Regional Education Authorities. The Sava region was the hardest-hit part of the country. In all, 80 per cent of the children affected by the hurricane were from here, and close to 60 per cent of the classrooms here were completely destroyed by the cyclone. Rachel Razafindrabetrema is a preschool teacher and the founder of the Andamoty school in the Sava Region. Her school was completely devasted by the cyclone. With funding from Education Cannot Wait, the school now has four working classrooms – complete with school tables and learning materials – that caters to students from pre-school to Grade 5. “Before, children were sitting on stones or stumps. Now they are more comfortable. Our school has become very attractive and parents are happy to send their children to school because the learning conditions are better. The number of students has continued to grow. In 2017 and 2018 we had only 100 students. In the 2018-2019 school year, our number of students is 500,” said Razafindrabetrema. At the close of the investment, in August 2018, the programme had helped over 54,000 pre-school, primary and lower secondary students to access temporary learning environments. The investment also rehabilitated 110 classrooms. Special efforts were made to bring school materials, tents and school-in-a-box kits to hard-to-reach places. According to UNICEF, some goods were transported 5 hours by boat before being carried on foot another 2 to 3 hours to reach children living in remote or cut-off locations. The programme also aimed at insulating the children and families of Madagascar from future risks and ‘building back better.’ As part of the long-term investment in disaster-risk reduction, UNICEF was able to replenish pre-positioned supplies to prepare for more cyclones. In January 2018, when Cyclone Ava hit Madagascar, the humanitarian organizations in-country had tarpaulins, recreation kits and school-in-a-box kits ready to quickly help the 48,000 children across 14 regions whose education was interrupted by the hard-hitting cyclone. With the support of Education Cannot Wait’s investment, and the broad coalition of implementing partners that made it happen, Faniriantsoa is back in school. Story by Liva Ratsambizafy, Education Emergency Specialist, UNICEF Madagascar, with Greg Benchwick, Education Cannot Wait.